Good electronics are critical. 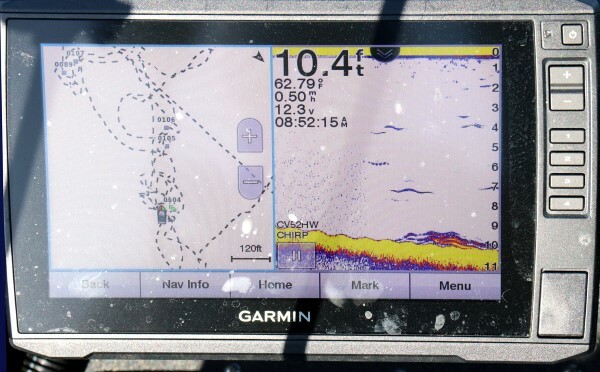 This shows Dan Dannenmueller’s fishing paths on one side of the graph and the sonar on the other. Perfect is not a good word to use when discussing fishing, but mid-depth stumps, brush and beds are as close to perfect as a fisherman can get. Why? Because middle depths are easy to fish, the fish aren’t spooky and any technique can be used to catch them. For tournament fishermen, it’s a depth where fish can be caught and kept alive. Electronics is a critical element when fishing open water structure. A stump at 12 feet can’t be seen without electronics. Once found, electronics lets a fisherman zoom in to determine if fish are on the cover and how they are situated. The key to today’s electronics is high-percentage fishing. This means a fisherman is putting baits on cover with fish on it. It’s doesn’t guarantee a bite, but it means baits are being fished in spots where fish are known to be located. Mid-depth is a general term. It might mean six to 15 feet in stained water, a little less in muddy waters, and deeper in clearer lakes. A little experience and asking questions will likely put you at or near the right depth before you hit the water. If crappie are believed to be at 12 feet, start an electronic search paying close attention to 10 to 14 foot waters. What you’ll find are contours and cover. Stumps, logs, laydowns, brushpiles and manmade beds are all wood covers that produce fish. Finding some near a drop-off is a great starting point. The fish have everything they need including shallower water for feeding, deep water nearby for escape or high light penetration situations and wood cover for shade and a feeling of safety. A Bobby Garland Swim-R is a great bait for jigging or slow trolling. Summer fishing has changed a lot during the years. 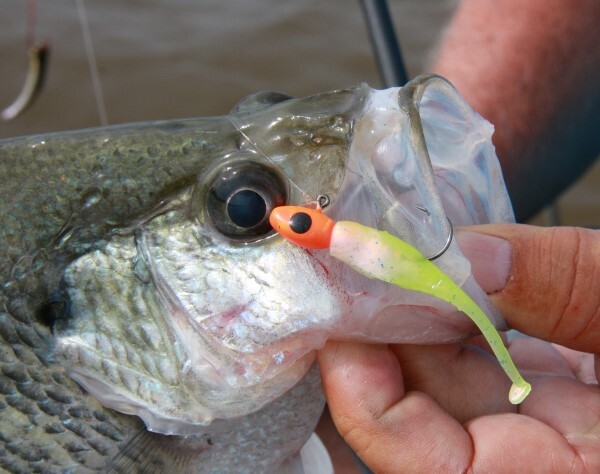 Fishermen today often troll jigs and crankbaits at high speed. This covers a lot of water looking for reaction bites from scattered fish. It works great in many lakes but it’s not the best technique when fish bury in cover. Slow trolling never goes out of style. It works year round on almost any lake or river. The top two reasons the technique is so deadly is that multiple baits are involved and they can be moved slowly or stopped. Multiple baits often means fishing four to six poles, or maybe more, where legal. Two fishermen fishing four poles each means there are eight baits in the water. They can be targeted at one depth or staggered to offer a range, like 9 to 14 feet. Double-hook rigs are common so in the above example, there are now 16 baits in the water at multiple depths. It’s a matter of mathematics, giving better odds for more bites. The obvious disadvantage is more hang-ups and more work. Double-hook rigs are not the same. Fishermen have different preferences. Also, situations require a specific rig. A typical set-up for fishing 12 feet of water would be a 1/16-ounce jig tipped with a minnow on bottom, a 1/2-ounce egg sinker 15 inches above the jig, and 15 inches above the sinker is a six-inch leader with a minnow hook. This rig provides enough weight for very slow trolling, offers a jig that is usually tipped with a minnow and a straight Mother Nature offering of a minnow. Variations include moving baits closer together or further apart, increasing or decreasing the egg sinker and changing the type baits. A normal situation would be to locate several spots with electronics, put baits down and slow troll up to the marked spots. Once at the wood, the baits are stopped and held in the strike zone. With waves and slight boat movements, the baits are never really still but do remain in an active zone. Even weary fish can often be enticed to bite. Think about desert after a big meal. You aren’t hungry but place pie and ice cream in front of you and it’s usually more than you can turn down. It’s the same with the crappie. Once at the wood, the baits are stopped and held in the strike zone. Fishermen at Truman Lake say very shallow water is good in the summer. Fishermen at other lakes may say the deep 20 to 30 feet water is best in the summer. However, there are usually mid-depth crappie in most lakes all summer long. There are exceptions, but don’t discount any depth until you’ve tried it. Sunshine: Sunny days can be an advantage because fish usually something to protect them from light penetration from the sun. They’ll likely move up tight into the cover. Clouds/Rain: Opposite of sunny, the dark days will likely scatter fish because they don’t need the cover. Cover may be good or mediocre. Look for fish to be over or around the cover. Cold Front: Summer conditions are better than spring because there are fewer cold fronts. Fish will get into a pattern and stay there for a long period of time. Fishing can be more consistent day to day. Boat Pressure: Most lakes can be a disaster during the summer. The key is to get to the lake at daybreak and stay until late morning when the skiers and jet skis come out in numbers. A trip on the Alabama River with Dan Dannenmueller revealed a perfect example of wood cover in mid-depth water. The photo of the locator shows fish on cover in 10 feet of water. “It doesn’t take much cover to hold crappie. Of course, the bigger and taller the cover the more likely it will hold numbers of fish. Baitfish, and the fact that there is something for crappie to use as a home-base reference point, are both important,” says Dannenmueller. He says electronics is the key to fishing submerged cover. Mapping, side view, down imaging, sonar and PanOptics are all very important because they save time. You can look at a spot and know whether to drop a bait to it or not. Dan and Sue Dannenmueller are fishing two national circuits this year, Crappie Masters and American Crappie Trail. The “Crappie Mates” team can be followed on facebook.